Kelp is a seaweed belonging to brown algae among seaweeds classified as blue-green algae, diatoms, green algae, brown algae and red algae. 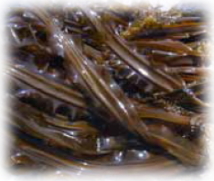 The true kelp (Makobu) from Hokkaido, which is a raw material of fucoxanthin contained in Fucoidan AF Premium, is known as a very high quality product. Fucoxanthin is contained in trace amounts only in brown algae such as kelp, hijiki, and seaweed, and it is a type of carotenoid (pigment). In recent years, performance studies of carotenoids as a health food have been in progress, we are also studying the performance of fucoxanthin. Fucoxanthin is said to be a very valuable raw material that can extract only a small amount compared to fucoidan. Since fucoxanthin is supplied only from brown algae, and additionally the amount of fucoxanthin contained in brown algae is set to about 0.1% of the dry weight, etc., it is dealt with at a very high price due to scarcity It has been. Fucoxanthin is oily in nature and is not soluble in water, but fucoxanthin used for Fucoidan AF Premium liquid is high quality fucoxanthin of water-soluble powder developed for the first time in Japan to dissolve in water. Recently, fucoxanthin is said to have stronger health power than fucoidan, mutual power with fucoidan is expected.